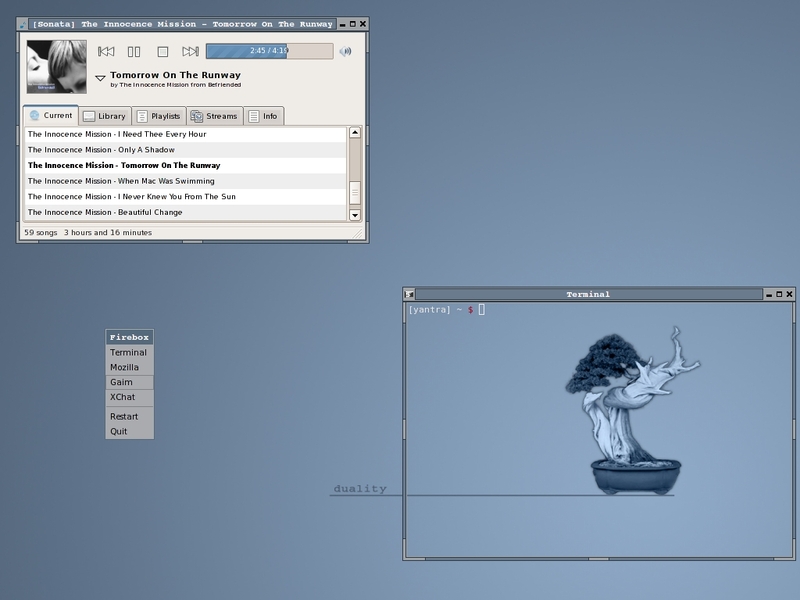 In my search for fun window managers to fool around with, I recently came across Firebox, a light and actively developed window manager, “something between Openbox and wmii: small, quite fast, eye candy and keyboard oriented, with some or[i]ginal features” (according to the website). I haven’t been able to test the latest version yet (0.5), as I couldn’t meet its dependencies on my experimentation machine running Ubuntu Dapper (please don’t ask me why I use a semi-outdated OS on an experimentation machine :-)), so for now I’ve only been playing with the previous release (0.4), which is about half a year old. So far, I’m liking it a lot. Sometime soon I’ll install 0.5 on a more recent OS, as, according to the changelog, it seems to have improved substantially in features (tabbed browsing, compositing support) and performance. As you can see it resembles Openbox: it has a root menu, but no taskbar, and its alt-tab and desktop switching dialog looks very much like those from Openbox 3.3. Firebox also has a nice configuration application, fbconf, which resembles Obconf. Like Openbox, the Firebox configuration is done in xml files. The website states that Firebox “is not forked from Openbox, Fluxbox, Blackbox or even Hackedbox; it is written from scratch, in C lang[u]age”, but it is clear where the developer(s) took some inspiration from. One of the neatest things about Firebox is its dmenu. Users of wmii are familiar with this: press Alt+P and a menu bar comes up containing all the installed applications; type the first letters of the application you want to launch, and it shows all the applications that start with those letters. 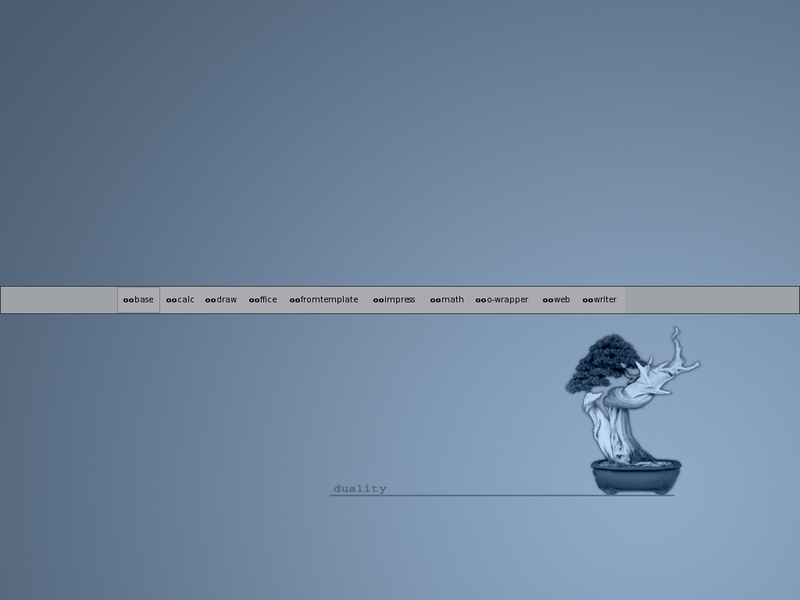 By default the dmenu bar appears in the middle of your screen, but you can also set it to display at the top or bottom. You can add entries to the dmenu, both to launch applications and to perform internal Firebox actions, though I have to admit I didn’t quite understand yet how exactly this works. 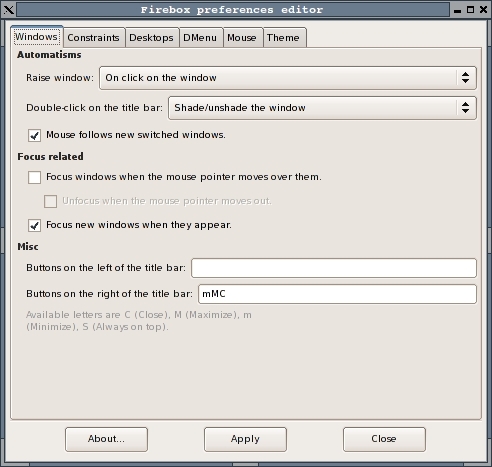 Unlike in wmii, Firebox’ dmenu can display icons, though by default it doesn’t do so. As far as I could tell, the root menu can unfortunately not be configured, which makes it rather unusable, and the developer is even considering dropping it all together. The combination of the dmenu and the root menu is great, though, and I hope both continue to be developed. Firebox has some nice touches, like the window geometry which is shown in the title bar (instead of the usual pop-up) when you resize or move windows. There are six themes available, but those don’t seem to work with 0.4 (they either crashed Firebox or didn’t load at all). The themes that are available are not quite along my aesthetic lines, but that is alright. The theme engine supports some pixamps. The theme options are a little confusing at first, but there are plenty of options to work with. The occasional bugginess of the dmenu, its crashes, and the unconfigurable root menu make this release of Firebox not very suitable to work with, but I’ve developed a certain fondness for it. Sure, it crashes at times, and has a few occasional glitches, but this project has potential. If it becomes more stable and increases its functionality (keyboard bindings, more window management options, tiling windows, perhaps even a dock/slit) this will be a solid window manager. At the moment it appears to be largely a one man project (the only developer is Cyrille Bagard), but hopefully others will join and help out. Though I won’t be using Firebox as a working environment anytime soon, I’ll use it as a play ground and will keep an eye on its development. Perhaps I’ll even create a theme or two for it, just to support it in a way that I can.